Toby in front, me behind. On July 14, I didn't go diving. I didn't even celebrate Bastille Day. I braved the crowds and went to Cowell's Beach, at the foot of the Municipal Wharf in Santa Cruz. Why? A very special bunch of people were there, organizers from Shared Adventures, an army of volunteers like me, and many disabled people and their families from all over Northern California. 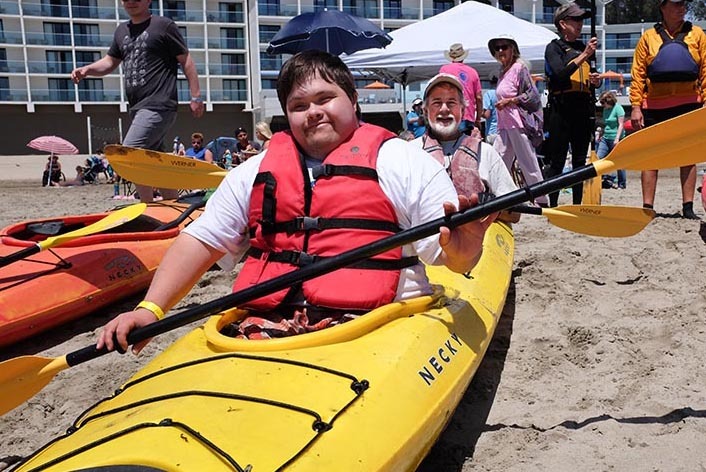 It was Shared Adventures' annual day to make it possible for folks who can't usually go kayaking, scuba diving, or just roll around on the beach to do those things. I paddled a tandem kayak from the beach out to the kelp bed near Steamer Lane where a group of Sea Otters were waiting for me and my passengers. I made five trips, in turn carrying carrying two autistic boys, a teen with Down's Syndrome, a blonde girl of about 10 who never spoke but smiled the whole time she was in the boat with me, and one woman who was paralyzed below the waist. My first passenger was an autistic teen, close to my own son in age. He couldn't use his paddle but loved to hold it down in the water and watch as the water flowed around it. Of course he was creating a sea anchor, but I figured that his enjoyment of seeing the pattern it made in the water was exactly the kind of experience we were trying to create. So I stroked a little harder and all had a good time. This was my third or fourth year volunteering as a kayak guide. It's always a full day, and this one was especially full with five trips, plus haulling extra gear that the organizers said they needed. I was very tired at the end of the day, but as I have every year that I have volunteered, I came away happy knowing I had given a few people a reason to smile. With the amount of traveling I do, I can't be sure where I will be when next year's Day on the Beach comes around, but if I'm in town I will probably volunteer again. If you'd like to share in the fun and good feeling, perhaps you would like to volunteer too. 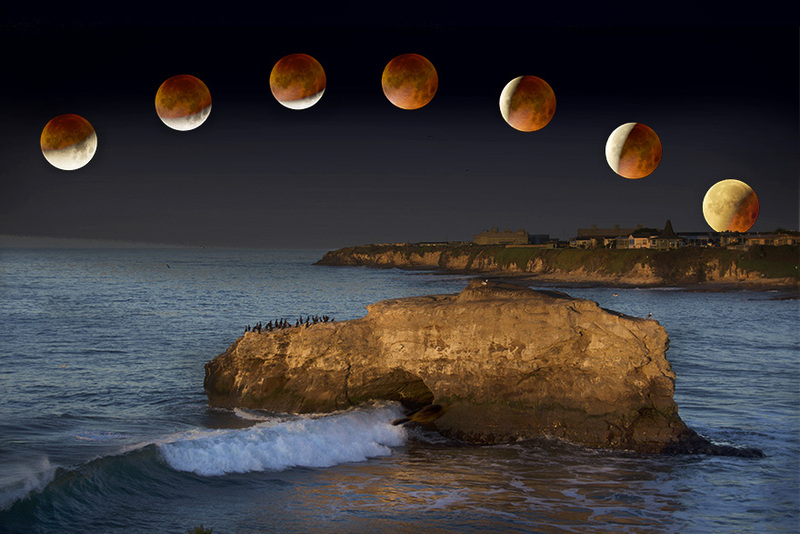 A composite time lapse of the Lunar eclipse, digitally placed above an image of Natural Bridges State Park taken as the first rays of the sun touched it at dawn the same morning. A few months after my adventure to see the total eclipse of the sun, I heard about another total eclipse that would be visible from near my home, this one of the moon. I set an alarm for just after 2am on Wednesday, January 31 and drove to a hillside overlooking the ocean near UC Santa Cruz. I hauled my tripod, camera, and telescope-like 600mm lens far enough from the road that headlights were unlikely to ruin my photos, and by the time I got set up the eclipse had begun. I stood out in the chilly pre-dawn air while the moon passed through the shadow cast by the earth. Unlike an eclipse of the sun, the eclipsed moon is not blacked out by an object passing in front of it; it slides into the soft-edged shadow cast by the Earth. And a little light, reddened by passing through the Earth's atmosphere, falls on the moon even at totality. While the eclipsed moon is sometimes called the "Blood Moon" because of its red color, the lunar eclipse of Jan 31 was actually blue. This bears some explaining: it was not blue in color, but lunar eclipses only happen on the full moon, and the full moon of that night was the second full moon in the month. And any time there are two full moons in one calendar month, the second one is called a "blue moon." Blue moons are rare (they average about once every 32 months) hence the old phrase "once in a blue moon." Why was this a Super Blue Blood Moon? Well, that's becasue this full moon and eclipse also co-incided with the closest approach of the moon to the Earth, in the moon's not-quite circular orbit. The moon gets about 5,000 miles closer to earth at perigee, it's closest approach, than its average distance. But have no fear, even at perigee its 223,068 miles away. The moon at perigee is called a Super Moon because the closeness causes it to appear super-big. But the maximum observed size increase is just 14%. I have photographed super moons twice and, to be honest, can't detect a size difference by eye. 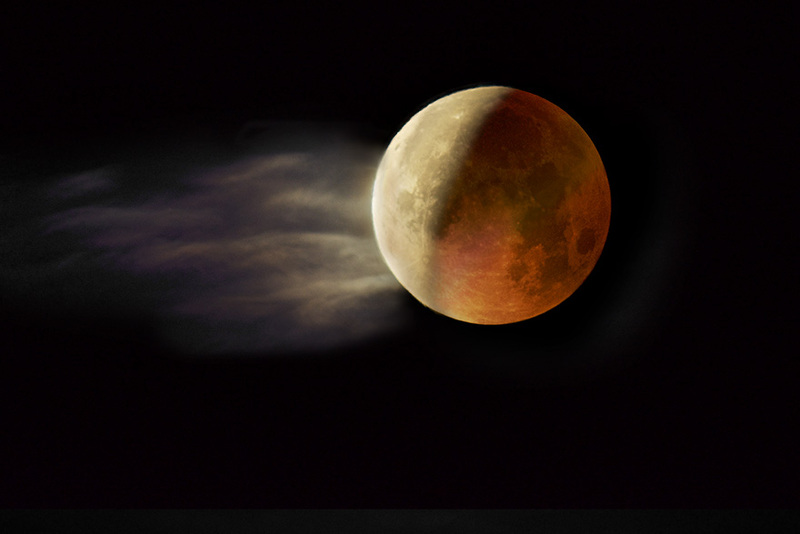 A cloud passed by the partially eclipsed moon as it was emerging from the earth's shadow. As the moon emerged from the Earth's shadow, it also slid behind the horizon to the West. The sky was lightening to the East as dawn approached. I hiked my camera gear back to the car and made a quick trip down to Natural Bridges State Park where I thought I might get a good view as the early light bathed the one remaining arch in orange light. I wasn't disappointed. After a few hours work in Photoshop, I put together nine images in a single composite (above) showing all the phases of the eclipse over the natural bridge. Unlike the sister image composite of the solar eclipse over Mount Hood, all nine photos were taken within a few miles and a few hours. In case you were wondering, "The Dark of the Moon" is defined as a period, such as a new moon or cloudy night, when moonlight is absent. I recognize the phrase as the name of a play that was performed at my summer camp decades ago. It is a story of passion and magic, adapted in the 1940s from a very old folk tale and ballad. 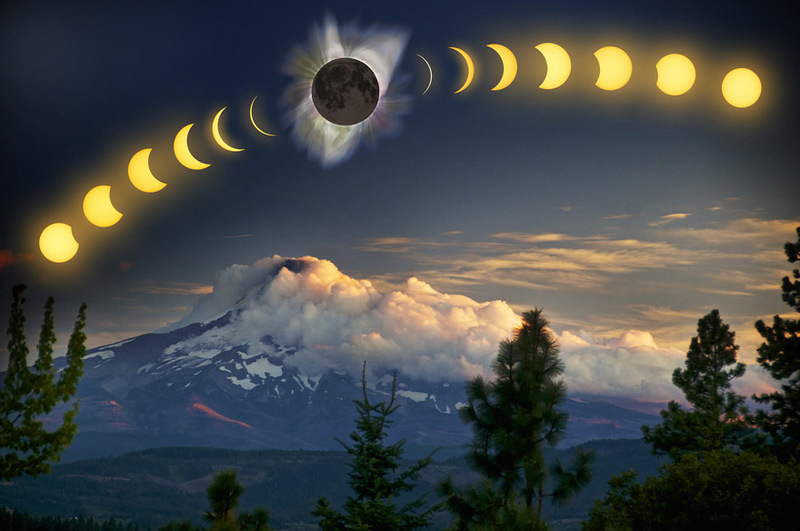 A composite time lapse of the eclipse, digitally placed above an image of Mt. Hood that I'd taken long before. Twenty-five years ago, my wife traveled to Hawaii specifically to witness a total eclipse of the sun. She was frustrated by the only overcast day they'd had in Kona in weeks. We began planning to observe the total solar eclipse of August 1, 2017 literally years in advance. I did online research on photographic techniques and equipment. She arranged to rent a camper trailer for us to sleep and cook in. Two of our long-time friends worked at NASA for years, doing research astronomy. They mapped the "path of totality" where the eclipse could be observed. They overlaid that with maps of typical cloud cover, then checked where totality and clear skies could be seen from public land where we could camp. We ended up planning to head for central Oregon. Smoke from wildfires forced a quick revision of our camping location farther eastward, and we ended up in a meadow at 5,700 ft altitude in the Ochoco National Forest, about halfway between Mitchell and Dayville, Oregon. If you aren't familiar with those names, I'm not surprised. Each of those little towns has fewer than 1,000 residents and probably hadn't seen visitors in the numbers drawn by the eclipse ever before. Our campsite was 5 miles distant from the relative civilization of a pit toilet. 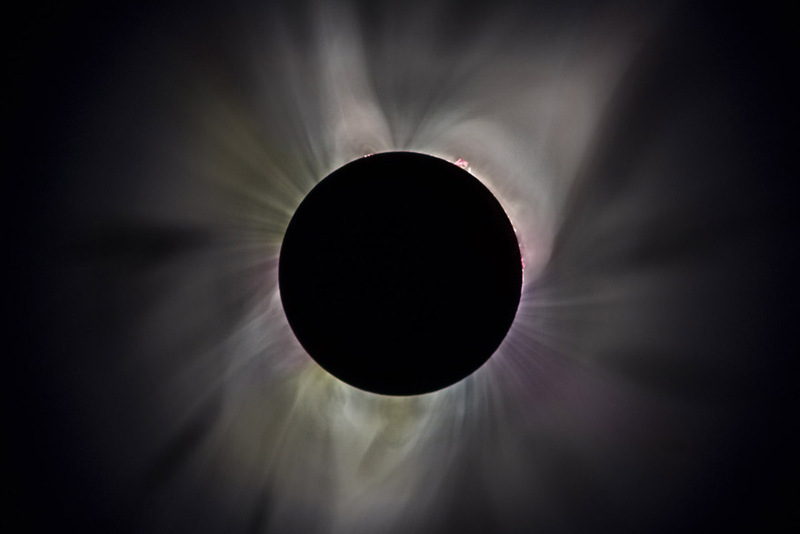 Six photographs are adjusted to match brightness and overlaid here to create an extended view of the sun's corona. I set up two cameras, one with a very long 600mm lens I acquired just for the event. I made solar filters for both cameras, so I could record the phases of partial eclipse as the event progressed. I assembled those images into a composite time-lapse you can see above. During totality, I had both cameras firing away, changing exposure automatically. It was the most sophisticated use of the automation built into my digital cameras I’ve made so far. It was well worth the effort. In the brightest images I can see the sun’s glowing corona extending out into space. But in the darker ones I can clearly see solar flares or “prominences” bursting from the surface. You really should see this image enlarged, though, to appreciate all the detail. 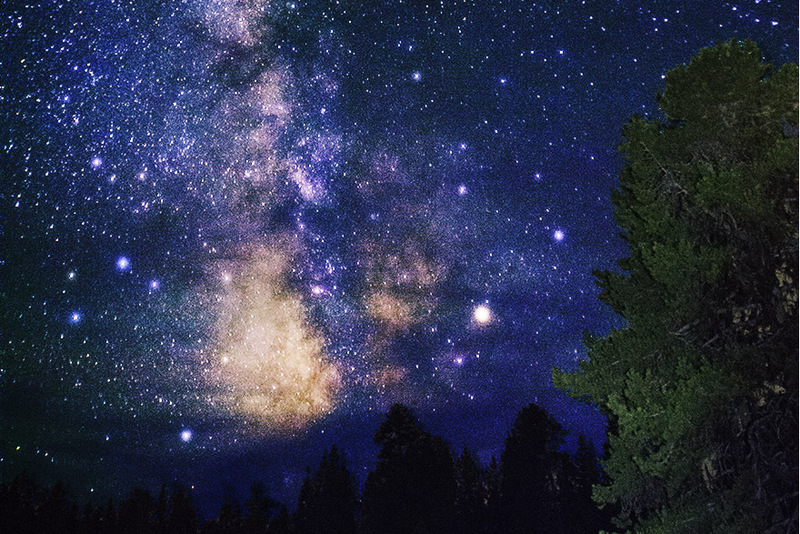 The Milky Way as seen two nights before the eclipse. The pine tree at right was "painted" with the light of a distant flashlight for less than 10 seconds. My son (who was 14 years old and entering high school just days after the eclipse) and I recently got a great lesson in photographing the Milky Way from a friend. The complete darkness in remote Eastern Oregon gave us an ideal night on Saturday before the Monday morning eclipse to practice our new techniques. We would have had a second night on Sunday, but smoke from the wildfires far to the west blanketed our camp as the sun set, and was just clearing from the eastern sky as the sun rose on eclipse day. I was very worried that all our careful plans and days of road travel might be wasted because of the smoke, but by the time the eclipse began it was almost imperceptible directly over head. We made good use of our single night with the Milky Way glowing above our heads. It took about 30 seconds to make each exposure. While the camera's shutter was open, I used a weak flashlight to “paint” light onto the single pine tree in the meadow we were camping in. My son captured what I think was an even better composition. He printed his shot and put it on display at my Open Studio! Smoke billows upward from Loma Prieta Peak at 3:35pm on Sept 26, about 45 minutes after the first report of fire. 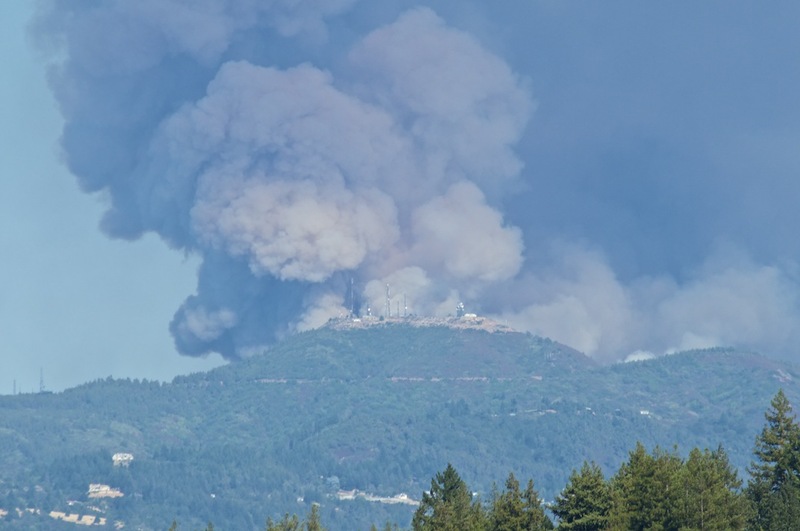 I began to hear the lyrics of an old Grateful Dead song in my head soon after new intern Michael pointed toward Loma Prieta peak on the afternoon of Monday, September 26, and said "It looks like there's a fire over there." Fire indeed: there was a huge fire on "my" mountain, Loma Prieta. The column of smoke was enormous and growing. Within a couple hours it spread across a large portion of the ridge. It was clear even from a distance that the fire was growing rapidly. Weather conditions were ideally conducive for a conflagration. Temperatures were in the 90°Fs at my house and probably near 100°F (38°C) where the fire was burning on the ridge. 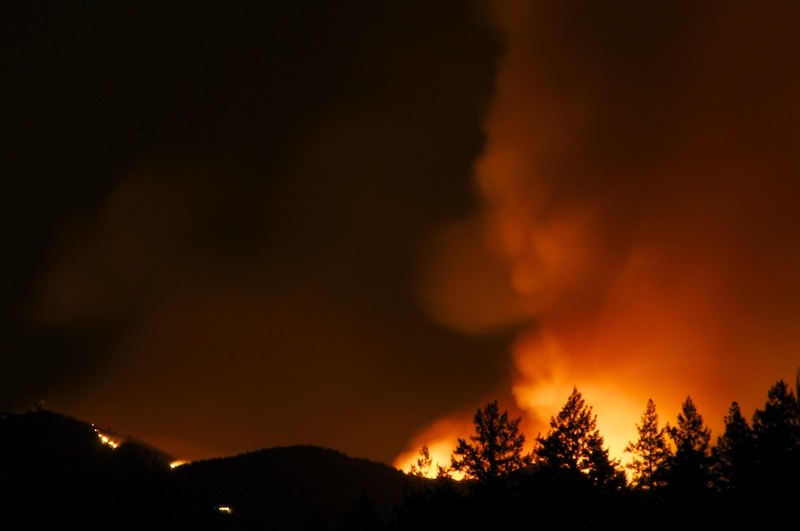 Smoke dominated a large sector of the sky for about three days, as viewers looked upwards from Felton, Scotts Valley Los Gatos, and points south all the way to Morgan Hill and beyond. It took two days for a small army of firefighters, aided by at least six aircraft to begin to get the fire under control. It is only thanks to these heroes that the damage to structures was minimized. As it was, hundreds of people had to evacuate, about 4500 acres burned. Remarkably, only 12 homes were destroyed. Flames light up the smoke cloud above the ridge at 1:25 AM, less than 12 hours into the event. Recent coverage in the San Jose Mercury News and also the Santa Cruz Sentinel repor the fire as close to fully contained as of October 4. Several concerned friends emailed to inquire if we were in any danger. No, never from this fire. It was about 14 miles (22km) from us and fouled our air only briefly. But every time there is a wildfire in the area, I go out to recheck for dry, dead wood and other potential fuels on my property. Living in a wooden house in fire country is risky business. Readers of a certain age will remember that Loma Prieta gave its name to a much larger disaster about a generation ago. That was the Loma Prieta earthquake of October 17, 1989. I didn't get home until three days after the main shock, and still recorded some startling photographs. 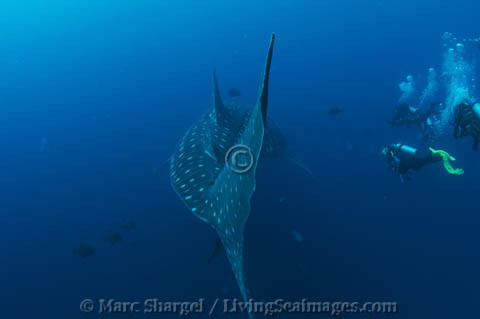 Whale Sharks are one of the featured animals in my Galápagos video. I am just back from an expedition of three-weeks duration to the Ecuadorian cloud forest and the “Enchanted Archipelago” of the Galápagos Islands. Charles Darwin was inspired to develop his theory of evolution when he went to the Galápagos in 1835. When I went in the 1990s it was the best dive destination I’d ever visited. After 20 more years of exploring Earth's oceans since then, I’ll still call the Galápagos the best I’ve seen, maybe the best on Earth. In two weeks there I watched children snorkel with cavorting sea lions, saw schools of silvery jacks and barracuda swim by me, watched eight-foot hammerhead sharks cruise along coral reefs by the hundreds, and got up close and personal with endangered green sea turtles. After stepping over hundreds of marine iguanas on a trail away from the beach, I spent a blissful half-hour on a cliff top, watching a blowhole along a shore of lava rock erupt as ocean waves rose to pressurize a narrow opening. Above the blowhole I saw albatrosses, whip-tailed tropic birds and masked Nazca boobies in flight. For a wildlife lover, it is difficult to imagine anything more thrilling. And then I had an experience underwater that eclipsed all of that—almost literally. As I clung to a reef 65 feet below a natural arch of rock named for Charles Darwin, an enormous shape cast its shadow upon the ocean below. Instantly I launched myself into the current, camera in hand, kicking my fins as hard as I could to converge with this slow-swimming giant. The spotted pattern of a whale shark resolved as I drew closer. As the gentle behemoth swam effortlessly by me I saw first the head, then the pectoral fins, the long body and finally the powerful tail, sweeping slowly from side to side, the tail alone taller than a tall human. The whale shark was so long—about 40 feet—that it took over half a minute to pass by me, like a slow train. In a day and a half of diving under Darwin’s Arch, I had 10 whale shark encounters, and saw an array of large fish and other sharks that would be the main draw anywhere else in the world. 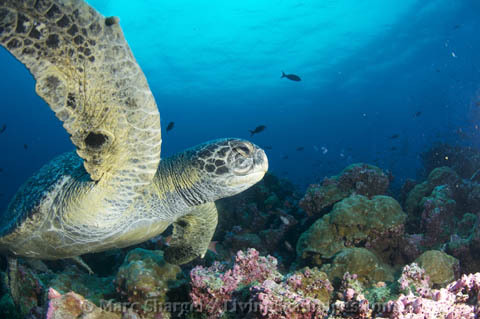 Green Sea Turtles, globally endangered, were another highlight of Galápagos waters. My main activity during all this action was to capture artful photographs of what I was seeing, but as I did that I often had my little video camera rolling. I've assembled a series of clips into a video of just over five minutes. You can see it here. Several times since I got back I've been asked for an assessment of the condition of the marine ecosystems I saw. I am glad to report I could not perceive, in a quick glance, any degradation compared to what I saw 20 years ago. Hammerhead sharks still school by the hundreds at the northern islands; endangered green sea turtles gorge themselves on algae that grows on the reefs; whale sharks which are being slaughtered senselessly in other parts of the world glide care-free beneath Darwin's Arch. Of the three major threats to marine life worldwide—global warming, pollution, and over-fishing—the Galápagos are relatively protected from two. There are two main population centers, each with about 20,000 residents, an airport and a seaport. Other than air, land and sea transportation, there are no heavy industries. So pollution would appear to be fairly light. Ecuador has instituted a set of marine protected areas throughout the islands, and banned industrial fishing throughout Galápagos waters. The most destructive of heedless fishing practices, such as shark finning and unintended but lethal netting of dolphins and turtles, are minimized or eliminated. With pollution and fishing relatively controlled, the Galápagos, based on my very brief and unscientific observation, seem to be in better shape than much of the planet. And so I celebrate. But there is still cause for concern. No local conservation measures can stop global warming. Last year's El Niño, which was probably amplified by global warming, decimated Galápagos Penguins and caused many other changes. While the ecosystem should be able to return to its previous point of balance over several "normal" years, warming may also be causing El Niño years to become more frequent. The latest research suggests that areas protected from other threats, like pollution and overfishing, have a better recovery from perturbations like El Niño. And the Galápagos have extensive marine protected areas. But the Galápagos system of marine protected areas contains huge "exceptions." 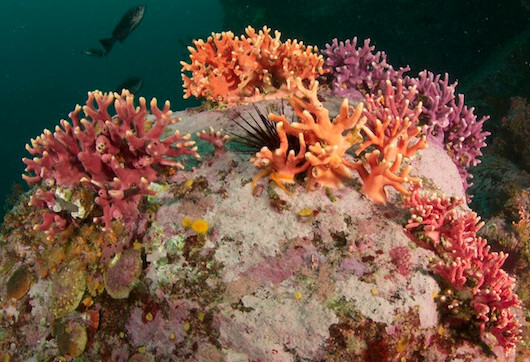 In the California system of marine protected areas, on which I worked directly from 2000 to 2007, a "marine reserve" prohibits all take of anything alive and alteration of habitat. In the Galápagos, local residents fish for food to feed the populace, and also to feed visitors, such as myself. I was told that the Galápagos tourist industry current hosts about 200,000 visitors a year. This fishing for local consumption goes on within the Galápagos “marine reserve.” Inside the "marine reserve" there is a more fine-grained designation of areas, akin to zoning. Most of the reserve is open to this local fishing, smaller areas are designated for tourist use only, and an even smaller proportion of areas excludes fishing and recreational use for research purposes. And as I mentioned, enforcement of all these boundaries is minimal. But despite all these exceptions and qualifiers, the system seems to be doing its job fairly well so far. Of greater concern, at least to me, is what happens in the future as the resident population of the islands grows further. Twenty years ago when I visited, there may have been only 10,000 to 20,000 permanent residents. Recent government statistics claim the current population is just over 26,000. But this is commonly understood to be wishful thinking. The two main towns in the islands are each home to 20,000 people. There is a third, smaller town and more people living on rural ranches over much of the two most populated islands. A long-time resident and tourist guide told me a more accurate number is somewhere above 40,000 permanent residents. Despite a 1998 law that theoretically halted immigration from the mainland to the Galápagos, free migration has no practical limits. The enforcement budget for that law does not exist, local police do not have authority to deport people who came from the mainland "temporarily" but never left. So the local populace continues to swell, and with it comes all of the impact humans have everywhere. In practice, I believe that the real control on environmental degradation in the Galápagos is the extraordinary economic value of the tourism industry, which is driven entirely by the extraordinary wildlife that lives there. I think that only when that wildlife looks, to tourists like me, under threat, will more binding limits be instituted. Lush Hydrocoral grows in a spectrum of subtle pastel colors on the deep seafloor at Schmieder Bank. Before I packed up for the Galapagos, I had already had a pretty good year of diving closer to home. El Niño brought warmer-than-usual water to Central California for the second year in a row. Sadly, the much-needed greater than normal rainfall that often accompanies El Niño did not arrive. 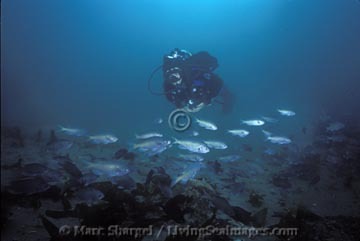 But the tranquil weather enabled me to make a return to what I believe to be the most spectacular dive site in California: an isolated, barely-reachable patch of ocean four miles off the Big Sur coast called Schmieder Bank. 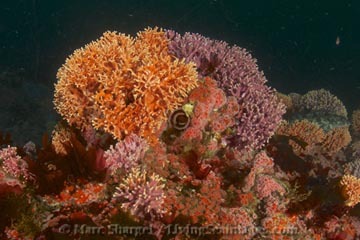 The bottom there is a carpet of delicate and slow-growing California Hydrocoral in shades of pink and lavender. Fat lingcod seem to be everywhere, and clouds of rockfish hang just above the bottom. But the dive isn't for beginners. The depth is right at the edge of recreational diving range. Many divers, including me, carry an extra cylinder of breathing gas in case something unexpected happens more than 100 feet below the surface. But a deep dive at Schmieder Bank is an opportunity I would not miss, despite the extra equipment it requires. Nowhere else is the Hydrocoral quite so lush and colorful. I will have images from my descents onto Schmieder Bank this year and last year on display during Open Studios. 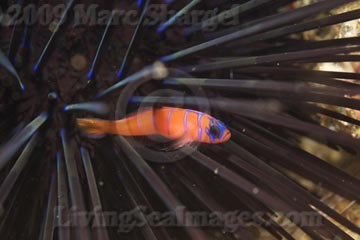 This is a nice photo of a Blue-Banded Goby, taken in Southern California where they "belong." On April 27, 2016, I shot one in Monterey. When El Niño pushes warm water up against the California shore, marine life usually seen farther to the south tends to follow. Last April (the 27th to be specific) while diving on a site called "The Barge" in Monterey, I saw and photographed a fish I had never seen north of the Channel Islands. It is the blue-banded Goby, a tiny fish whose splash of color is sure to catch one’s eye. I couldn't believe my eyes when I spotted one this far north. But I have photographic evidence to prove it. 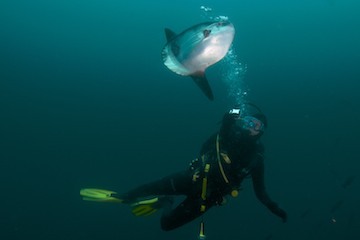 Ocean Sunfish (Mola mola) were a highlight of the fall of 2012. They appear, along with Dolphins, Orcas, Octopi and more in my new California/Pacific video. I gathered clips from my video captured over teh last four years and put them into another short piece. In just over six minutes you can follow me on marine adventures in Monterey Bay, Carmel Bay, Fiji, and British Columbia. You'll go boating with Dolphins and Orcas, and dive with Ocean Sunfish, Octopi, Lingcod, Egg-Yolk Jellies, Wolf Eels and several kinds of Rockfish. 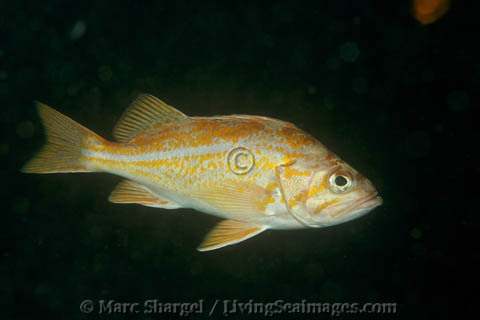 I photographed this scarce Canary Rockfish in the recently-expanded Point Lobos State Marine Reserve in September 2012. At that point it had been living in protected habitat for five years. It may live to more than 80 years old. On March 23, 2016 I gave a talk at the Felton Branch of the Santa Cruz Public Library. The title of the talk was, How a Regular Guy from Felton Helped the State of California Heal the Pacific Ocean, and Ended Up in the Book Business. Pretentious, yes, but entirely true. The evening was a benefit for Felton Library Friends, a community group working to relocate the library into a new building from its current cramped quaraters, a church built in 1893. Every seat in the room was filled as I described how my underwater observations led to advocacy for the creation of marine reserves, then to political action and finally to creating books to illustrate what I had been talking about. One member of the audience was there reporting for the Santa Cruz Sentinel and a very nice article resulted. The reporter, Kara Guzman, asked thoughtful questions and the resulting piece gave a good, concise summary of the salient points. I think it makes worthwhile reading. A Southern California kelp forest floor covered in almost nothing but brittle stars. Found near Santa Barbara Island, September 2015. I have been an observer of the ocean for 37 years now, privileged to check in on local marine life firsthand every few weeks or months. Fifteen years ago, changes I had already seen motivated me to volunteer long, hard days of work in the interest of creating marine reserves. Reserves are special areas in the ocean set aside, like parks, protected from human exploitation and preserved for human appreciation. Just five years after they were established, Central California's new Marine reserves yielded data indicating that they were working: fish were getting bigger and more diverse, ecosystems were looking more robust. A patch of seafloor off Pacific Grove featuring a Rock Scallop and dozens of exposed sea urchins, February 2015. In the last year, I've begun seeing patches of seafloor in Monterey Bay and Carmel Bay where that diversity is crashing. In Southern California's Channel Islands, we had often visited dive sites that had become "urchin barrens," areas where sea urchins had suddenly and inexplicably proliferated in huge numbers. The urchins gnawed away at the base of kelp plants, setting them adrift, and entire kelp forests floated away with the current. Urchin barrens are a phenomenon that has been studied by scientists for two or three decades now. The conventional wisdom has been that they could not form any areas where sea otters are present, since otters have enormous appetites and prey on urchins. Early this year I began to see huge numbers of urchins out in the open with no protection from the voracious otters. 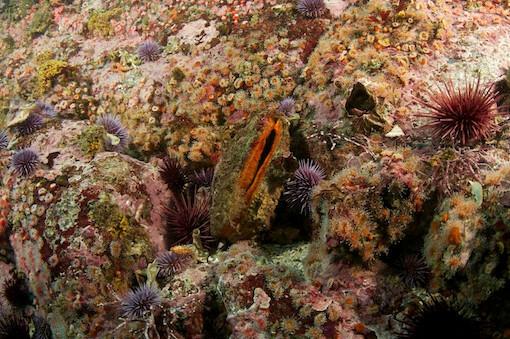 I wondered whether some of my favorite dive sites were on the way to becoming urchin barrens, and also why otters were not feasting on the urchins? Point Lobos State Marine Reserve is renowned for its lush and diverse marine life. Here, delicate California Hydrocoral adorns a rock. The same day I first found urchins proliferating in Monterey Bay, I saw other patches of seafloor inundated even more completely by brittle stars. I had become acquainted with brittle stars as reclusive animals usually found cowering in the most protected spots, like under an abandoned abalone shell or beneath a rock. Finding one would be a treat, as they are delicate looking and often quite colorful. 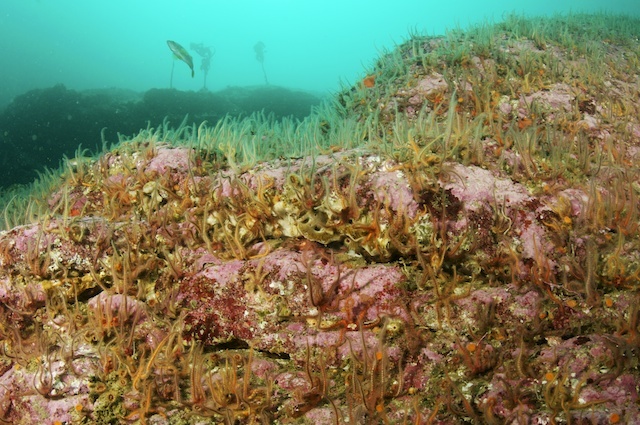 Now large patches of ocean bottom are looking like the underwater equivalent of cornfields, utterly dominated by a single species which has displaced dozens or hundreds of other colorful critters that used to be there. I had seen "brittle star barrens" in Southern California, too. Those observations went back 10 or 15 years, attended by puzzled conversations with fellow marine naturalists about what was going on, and why. Of course, cornfields are planted intentionally. These patches of brittle stars had arisen on their own. Whether the cause(s) of their appearance were entirely natural or a consequence of human activity, we could only guess. Just yards away from the Hydrocoral, this patch of bottom in Point Lobos' Bluefish Cove is over run by brittle stars. In August I dove at Point Lobos State Marine Reserve, a place I visit often. Diving there is a joy as the small marine reserve that had been created there in 1973 became vastly larger in 2007 as a consequence of the work in which I was a participant. Over 40 years of reserve status has allowed marine life in Point Lobos to become diverse, plentiful and large. Stories of divers petting fearless fish there are not uncommon. But deep on a favorite spot in Bluefish Cove, I found a patch of bottom also overrun with brittle stars and populated by almost nothing else. Whatever was giving rise to"brittle star barrens" in Pacific Grove was at work inside of Point Lobos, too. These changes look, to this non-scientific observer, like major ecosystem shifts. Where I have seen them in Southern California, the new regimes of urchins and brittle stars have remained in place for years, resulting in impoverished marine life and sad days for divers who knew the areas in the full flower of their diversity. I am glad to say that several dives along the Big Sur coast south of Point Lobos conducted last June showed no signs of urchins or brittle stars taking over in those areas. Could the Monterey and Carmel marine ecosystems, and the dive sites enjoyed by so many, which I and others worked so hard to protect, be at risk from something we neither anticipated nor understand? The mysteries posed by my recent observations remain mysteries for now. I have heard that some scientific investigation of this phenomenon is underway. I'll be checking into the current state of knowledge about it and writing more in the coming months. Keep an eye on my blog for further information. 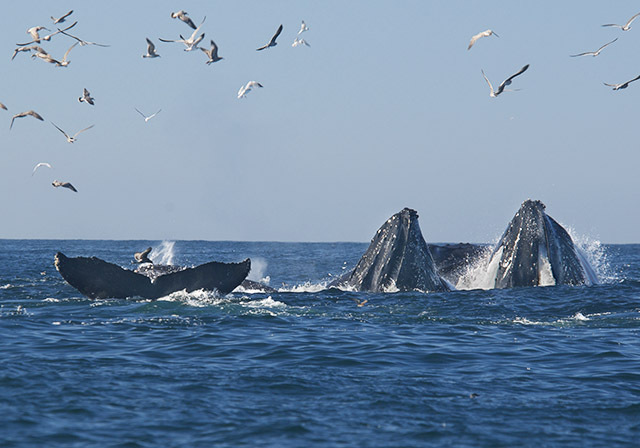 Five Humpback Whales, lunge-feeding near Moss Landing on September 18, 2015. On Wednesday, September 16 my wife Chris went for a walk along West Cliff Drive, near the iconic lighthouse in Santa Cruz. If you were lucky enough to be there that day you saw what she did: Humpback whales just a few feet off of the beach lunging through schools of anchovies with their mouths agape. The local paper wrote about the amazing event. I went with her following day, camera in hand, hoping for a repeat performance. But the anchovies and almost all of the whales had moved on. The next day my mother (fresh from celebrating her 80th birthday) was visiting. My son had no school, and Chris suggested we all get up early and ride my dive boat out into Monterey Bay in search of whales. So with the 12-year-old confidently manning the helm, we motored westward from Moss Landing. Just outside the harbor we encountered an old friend carrying a couple passengers on a similar expedition. None of us had long to wait. Just a few miles offshore we saw the foggy puffs of whale blows on the horizon. Flocks of seabirds concentrated above schools of small fish, anchovies we thought. Then, suddenly emerging from the ocean were the mouths of four or five Humpback whales, water streaming from between their jaws. Water passed through the whales' baleen but the little fish could not. Humpbacks have no teeth, they use baleen to strain small fish and even tinier krill from enormous mouthfuls of seawater. I'd seen whales in the Bay before, and I knew their feeding biology well from reading about it, but I'd never been able to watch whales feeding before. I was thrilled that three generations of my family could share the marine magic. My shutter clicked away furiously as my mother gasped and then squealed with delight. Despite eight decades of life, it was her first close encounter with these magnificent giants of the sea. Whales are rarely sighted near her home in Ohio. Once again, I was glad to live in Central California. Warm Water Again: El Niño Says, "I'm Baa-aack"
Like that ominous, unstoppable character played by Jack Nicholson in The Shining, El Niño is preparing to launch its mischief on the world this winter. NOAA is estimating a 95% chance that El Niño conditions will continue through this spring. Unlike the demon played by Nicholson in that 1980 movie, this year's El Niño may be welcomed in. It could bring a wet winter to California, potentially relieving an extreme, years-long drought. But if the much-needed rain returns to California, it could also be at the expense of parching places like Australia and Indonesia, which get drier in El Niño years. Last year, we saw a "mini El Niño." Ocean temperatures in a narrow band along California's coast spiked as much as 10°F above normal. I wrote then that the energy contained in that warm water would produce a wet winter last year. For about a month, that prediction looked good as rainfall in December 2014 ran about 150% of average, before the rains failed. This year, temperatures are not quite as high but the warm water is spread across a huge expanse of the Pacific Ocean, meaning that a longer and more powerful El Niño is more likely. El Niño only "opens the door" to wet weather in California. Here in Santa Cruz County, the El Niño event that began in 1981 caused devastating floods in the first week after New Year's of 1982. Even though the El Niño events of 1995 and '98 were more powerful than that of 1981, they produced floods that were not as severe, locally, as those of 1982. NOAA currently estimates that this year's event is as strong or stronger, globally, as any on record. What that means for any locality is impossible to predict. We are hoping for a strong rainy season, of course, to end the drought here. But as a wise teacher used to tell me, "Watch what you wish for, you're liable to get it." Warm Water: Message in a Bottle? The warmest surface temperature I've ever seen in Central California, a couple hundred yards off Capitola Beach, August 2, 2014. You know the story about the castaway that put a message into a corked bottle and tossed it into the sea, right? The sea brings us lots of messages if we know how to read them. One message I’ve been reading in recent months is an increased chance of a wet winter. I know this is a prediction we’re all hoping for, as California desperately needs a break from this year’s severe drought, so I hope I’m right. The sign I’m interpreting is the very warm water temperatures in the Pacific just off our beaches. By late July, surface temperatures off Point Lobos were above 60°F. In early August, the water in the middle of Monterey Bay was 64°F, easily 10 degrees above “normal.” Surface water south of Point Lobos was 61-63°F, and those temps were consistent down to forty feet deep that day. Dive buddies who visited the islands off San Diego over the Labor Day weekend reported 73°F, more than five degrees above typical readings. When you put a pot of water on the stove, even before it boils it begins to steam. The warm ocean water off our coast will evaporate and form more clouds than cooler water would. That would make us think more rain will fall somewhere. The last time I saw the ocean get this warm was October of 1997. That month, while diving in Monterey, I photographed blacksmith, a kind of fish usually only found well south of Santa Barbara. 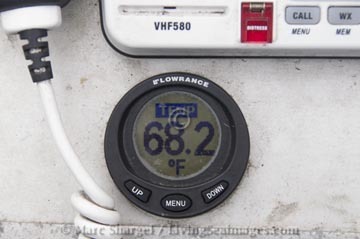 The water was around 65°F. Four months later, in February of 1998, extremely heavy rains swelled the San Lorenzo and Pajaro Rivers so much that they caused major flooding. Blacksmith, a typical Southern California fish, photographed at the Monterey Breakwater in October of 1997. The water was about 65°F. I don’t know if this winter’s rains will even be above average. Climate scientists tell us that predicting the El Niño weather pattern that brings heavy rain to California depends on the warmth of water all across the Pacific. And they differ on interpreting the current indications for an El Niño. Even if El Niño does materialize, the rains could pass us by. But our local ocean has been “cooking up” interesting consequences: see our next article. 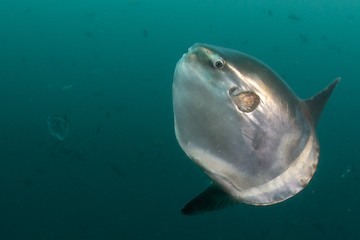 A large Ocean Sunfish or Mola mola. Surely this is one of the oddest creatures on the planet. It looks like somebody began to draw a fish, but forgot the back half of the body. One immediate bonus brought by this season’s warm water was the appearance of some infrequent visitors. In late July and early August we spent three days on the water in the space of a week and a half. On each day we spotted a certain type of fin lazily waving above the surface of the smooth water. The fins were big, but the wrong shape to belong to a shark or dolphin. We approached carefully and each time discovered a large Ocean Sunfish or Mola mola. Small molas are frequently seen in the fall in our area. In 2012 we had an amazing dive with over a dozen of them, including one that appeared to have been bitten by a shark. We wrote about that day in our blog, too. We know that sea lions prey on small molas, we’ve even photographed the action. But the ones we saw this summer were about as big as a human, we estimated five feet long. We saw them in Carmel Bay, and to the south of Point Lobos, and out in the middle of Monterey Bay. 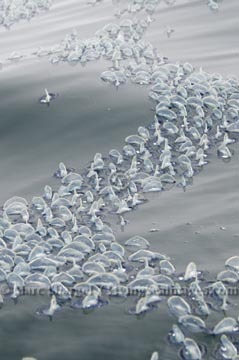 Velella velella, the "By-The-Wind Sailor," a peculiar floating jelly. Like rudderless sailboats, these landed in the kelp in Whalers' Cove. 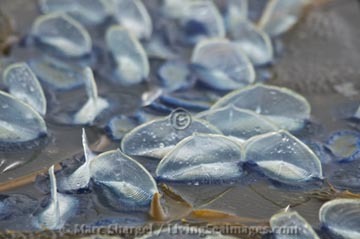 We saw the big molas close by another unusual visitor, a small jelly called the By-the-Wind Sailor, Velella velella. Velellas are the strangest of jellies. They have more in common with boats than with other jellies: they are oval shaped, about four inches long, and float on the surface of the ocean. They have a texture more like plastic than jello. Unlike other jellies that “swim” underwater by pulsing their bells, the body shape of velellas makes them a sailboat. The upper part of the velella, which catches the wind, resembles the sail of a boat tacking across the wind. The lower part, which is below the surface, is a hanging ring of short, blue tentacles. 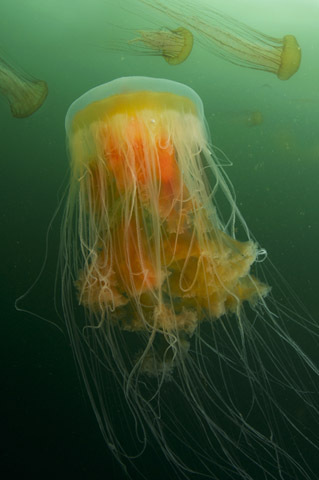 They use their tentacles as do the more typical jellies, to sting and gather food. Usually when you spot one velella, you’ll be able to find many more. Sometimes thousands more. On August 1st we discovered velellas coating patches of the ocean’s surface. One of the many patches of the ocean off Carmel that was covered by Velellas in late July. Now why were we seeing velellas and molas near each other? As my boat drifted near a pair of five-foot molas I found out. 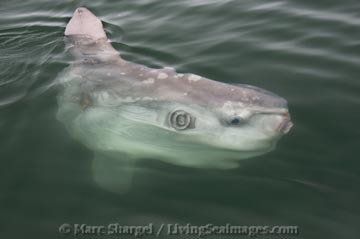 I stood watching as one mola swam slowly, straight toward the boat. I could see it below the surface, angling upward. As its head reached the surface, the mouth opened and gently sucked in a velella. The molas had come in to take advantage of an enormous feast! A pair of Orcas headed for a Sea Lion haul out in British Columbia. Time for lunch ? Our summer of encounters with unusual visitors reached its peak after our dives on August 1st. 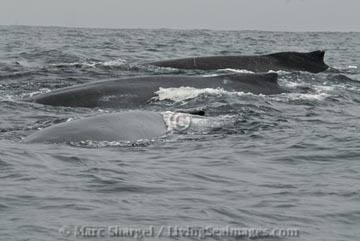 Heading homeward, we spotted two tall, black fins about a mile off the Carmel Highlands. Orcas! A pair of them, cruising southward. At one point they surfaced so close to the boat that we heard the blows almost before we saw the fins. 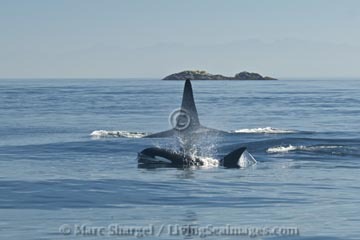 We had seen a humpback whale in the area, too, but the orcas did not seem to be hunting it, they just kept traveling. Orcas are occasional visitors in Central California, but regular residents off the islands of northern Washington State and British Columbia. In September, near the northern end of Vancouver Island, we watched a trio of Orcas hunting Steller Sea Lions. Marc Shargel releases a new publication. Marc Shargel's newest, much-awaited publication has just been released. Yesterday’s Ocean: A History of Marine Life on California’s Central Coast is now available in e-book form. Yesterday’s Ocean traces the arc of human exploitation of several types of marine life, with emphasis on species native to the Monterey Bay and surrounding waters. The stories are told in pictures as much as words, with some photos by the author, but many more from historical archives. Imagine piles of abalone shells taller than a man, or stacks of sharks caught for the vitamin A in their livers. Where would you look to find a billion pounds of sardines? They're all inside Yesterday’s Ocean. Best of all, the e-book of Yesterday’s Ocean is available to you free of charge, right now. You can read it on-line using most any web browser. A version for mobile devices is in development. If you'd like to be notified when the mobile version is available, please Subscribe to our Newsletter. Yesterday’s Ocean has attracted a flurry of media attention. Marc was interviewed for an installment of the Thank You Ocean Podcast. A slide show came out on the Ocean Conservancy website, and the Natural Resources Defense Council's blog included a recent article. Yesterday’s Ocean is Marc Shargel's fourth publication, but the first to cover his home area of Central California. Previously, he released three printed coffee-table books in the Wonders of the Sea series, covering each region of the state except Central California. Shargel hopes to produce a fourth book in that series, on Central California. The exhibit will hang in the main auditorium of the MAH from the First Friday in September (the 6th) through the 22nd. On Friday evening the 6th, the museum is hosting an opening event with many of the artists, including Marc Shargel, present. The event is part of First Friday Santa Cruz, which is a monthly art event at multiple venues throughout the county. The opening reception at MAH is 5pm to 9pm, Friday evening September 6 and admission to the museum that night is free. The Santa Cruz Museum of Art and History is at 705 Front Street, in the heart of downtown. Coastal cleanup is a great opportunity to help our local ocean very directly: with your own hands. We know the importance of recapturing trash from direct observation. Just a few days ago, miles off the Southern California coast, we saw a tattered bit of duct tape drifing through a kelp forest. At first we wondered if it was a jelly we weren't familiar with. Small pink fish called señoritas seemed to be feeding on it, as they do on many jellies. Realizing it was human trash, we swam into the cluster of señoritas and collected their would-be meal. Plastics have been identified as a lethal cause of digestive tract blockage in some sea birds; we hope the little fish didn't ingest much of the duct tape. "Coastal cleanup" is a pretty regular activity for us: most days on the ocean we pluck at least one bit of drifting plastic trash from the surface of the ocean. We hope you'll come see the art exhibit at MAH, and take part in the coastal clean up event, which is on Saturday, September 21 this year. Marc Shargel featured on the Thank You Ocean Podcast and other online media. Thank You Ocean is a five-year-old podcast that does a wonderful job of informing the public on ocean-related news and issues. Veteran environmental reporter Jerry Kay does the interviews and he and his production team have reached a high level of quality with the series. 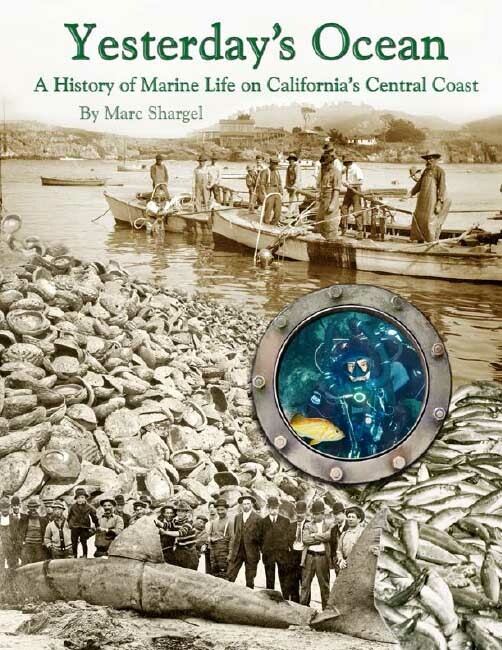 The current issue edition of Thank You Ocean features Marc Shargel talking about why he created Yesterday’s Ocean: A History of Marine Life on California’s Central Coast. Jerry Kay's interview was right on point, the editing helped convey the message in under five minutes. The visuals that illustrate the interview give you an accurate sample of the experience you'll have when you look inside Yesterday’s Ocean. The Huffington Post's blog page recently included an article about Yesterday’s Ocean. Yesterday’s Ocean is the subject of a slide show just posted by The Ocean Conservancy on their Blog Aquatic page. The slide show summarizes the story in the Yesterday’s Ocean e-book in a series of less than two dozen visuals. Yesterday’s Ocean is also subject of an article on the Natural Reources Defense Council's "Switchboard" blog. 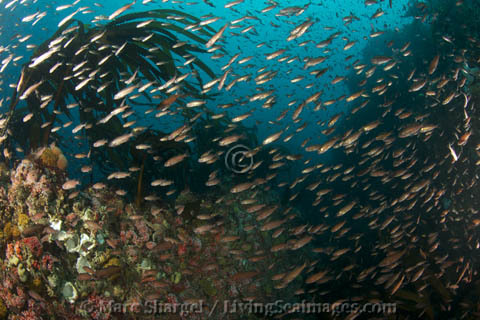 Beginning in May of 2013 we started seeing extraordinary numbers of tiny rockfish, less than two inches long. The numbers have been so enormous that there were clouds of little fish in some areas. Juvenile Blue Rockfish have been the most commonly seen, but we've noted five or six different species at least. In June we spent three days diving off the remote Big Sur coast and were lucky to enounter some of the clearest water we'd ever seen in Central California. The combination of rare ocean conditions and rare marine life abundance made for an amazing trip. The underwater vistas looked more like the Carribean or the Indo-Pacific than what we're used to around here. Of course, the water temperature, as cold as 48F, brought us back to reality. We've captured and posted over 125 images of this historic event so far. Rockfish spawn and hatch once a year; the young appear in the spring. Fish of just a couple inches in length have hatched within the last few months; biologists refer to them as young of the year (YOY). We've observed YOY Rockfish almost every year for decades, in numbers of up to a few dozen. 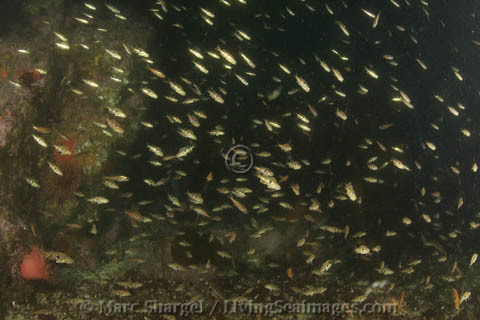 Just once, in 2007, diving at Shelter Cove on the "Lost Coast" of Far Northern California, we encountered a cloud of YOY Rockfish that numbered a few thousand. This year we've been seeing them in the tens of thousands. In fact, 2013's influx of young fish anything we've seen in 35 years, and even anything we've heard about. This year's new recruits have been widespread and varied. We've seen clouds of YOY from Carmel Bay all the way down the Big Sur coast as far as Cape San Martin (north of San Simeon), at every spot we've gotten in the water. Reports of similar clouds of fish have come from Monterey, and there has been evidence of that similar activity has been going on as far north as Año Nuevo, north of Santa Cruz. We've identified juvenile Blue Rockfish as the most prominent species in this year's event, but we've also seen the young of the scarce Canary Rockfish, Half-banded Rockfish (which live so deep as adults that we'd never seen one before), and at least one of the three species that are impossible to distinguish as YOY. These are the Kelp, Gopher, and Black-and-Yellow Rockfish. Rockfish have reproductive success only when oceanographic conditions are just right: water temperature, currents, availability of tiny planktonic food all have to favor their survival. This year, apparently, we've had a "perfect storm" of factors aligning to permit a Rockfish population boom. Because human consumption has affected many species, and depleted some quite badly, this is a very good thing for our ocean overall. Of course the fertility of rockfish also depends on having a significant breeding population somewhere. Recently, scientists have discovered that many fish, including rockfish, become more fertile they older they get. Great-Grandmother rockfish produce clutches of eggs many times larger than their younger counterparts. So the fact that some of the little fish appearing this year will have the chance to live to old-age, within marine protected areas, is also a very good thing for the ocean. 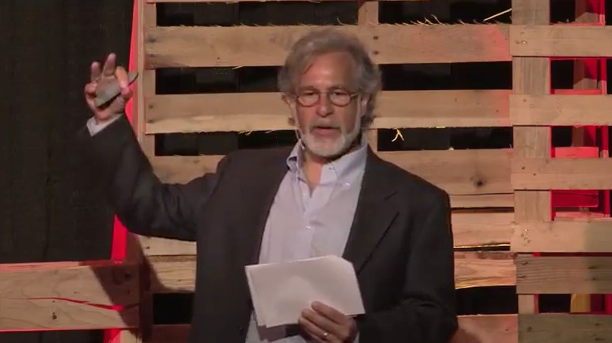 Video of Marc Shargel's talk at TEDx Monterey is now available online. On April 13 Marc Shargel delivered a talk at the TEDx Conference in Monterey, CA. Entitled Yesterday’s Ocean, like his new e-book, the talk presented stories of marine life and its human use through 200 years of Central California Coast history. In response to many requests we've received for access to the video we are, at last, able to provide this link. In celebration of Underwater Parks Day in California, the Aquarium of the Bay at Pier 39 in San Francisco will be hosting a presentation by photographer and author Marc Shargel on Saturday, January 19, 2013. From the comfort of your chair in the Aquarium's Bay Theater, Shargel will transport you with photographic visions from beneath many of our state�s newly protected underwater parks. 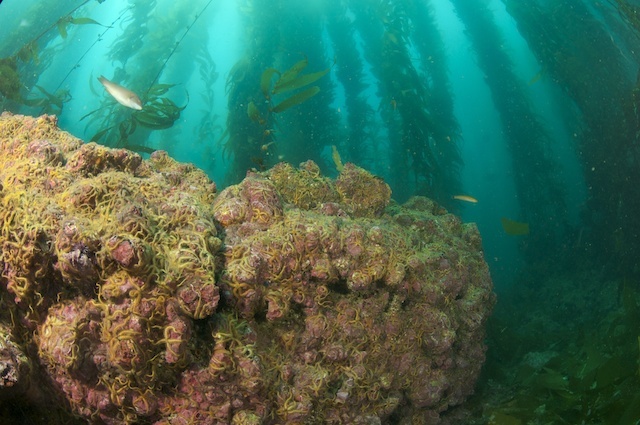 California is the first state in the country to establish a state-wide network of marine protected areas, a fourteen-year effort that just concluded one month ago. For complete information, including links to a map, a free sea lion tour, and how to get a 50% discount on admission to the the Aquarium of the Bay at Pier 39, see my events page. Among my most vivid childhood memories are days spent on the beach at Lake Erie. Yes, I grew up in the Cleveland area. That was in the 1960s when industrial pollutants were turning the Great Lake into what would soon be called a "dead body of water." In 1969, the oliy water of the Cuyahoga River, which empties into the lake in downtown Cleveland, turned a dock fire into a conflagration. The event lives forever in Randy Newman's musical lampoon, Burn On. My grandmother and I were sometimes turned back from walks along Lake Erie's shore by the stink of rotting fish that would periodically wash up on the shore. As she read books by Rachel Carson, I was getting a first-hand lesson in environmental thinking. Forty-five years after those shoreline walks, Lake Erie is in far better condition. Now far from "dead," the lake, and the region, have recovered from the excesses of the 60s. Visiting family in the Cleveland area for the holidays, I happened upon a fascinating article in the Dec 30, 2012 issue of the Cleveland Plain Dealer. The article describes the recent discovery of plastic trash adrift in the middle of the lake. You're probably aware of the "Great Pacific Garbage Patch," a vast stretch of the ocean where immense amounts of plastic concentrate in the middle of the ocean. Miriam Goldstein, who contributed photography to my second book, has done research there, and written extensively about it. Now the Plain Dealer has reported that another scientist, Sherri "Sam" Mason, of the State University of New York at Fredonia, has done a study to sample plastic particles in the waters of Lake Erie. The result: patches of Lake Erie contain up to twice as many particles of plastic as in the most contaminated ocean samples on record. "The minute plastic pieces pose an enormous problem," continued the Plain Dealer story. "Micro-plastics act as powerful magnets of petroleum, industrial chemicals and other harmful pollutants. They can be ingested by sea life and work their way up the food chain.
" 'As much as we want to think that humans are not part of nature, we are,' Mason said. 'If we can find plastic in a bird or a fish, we can find it in us.' "
She plans to survey fish from the lake, to see if their bodies contain plastic particles like the water they swim in. I don't know whether to be encouraged or depressed. The environmental legislation of the early 1970s—the Clean Water Act, the establishment of the EPA, to name a couple examples—has done enormous good, including reducing industrial discharges into Lake Erie. Now it seems, the big problem is us. Well, I still believe the old saying is true: "If the people lead, the leaders will follow." And if we're the problem, we can be the solution. Or as Walt Kelly's Pogo said "We have met the enemy, and he is us." Wednesday, November 7 was a nearly perfect day for diving. The swell was small, winds were calm and there was no offshore current. My buddy and assistant Anneliese Kupfrian and I took advantage of the conditions to dive a pinnacle south of Point Lobos, far offshore. Arriving at the spot, I watched the boat's depth sounder to find the peak I was looking for. To my surprise, I discovered a ridge emerging from deep water (110') more than 100 yards from the spot I'd had in mind. A discovery! The peaks of the new ridge were shallower than the pinnacle we'd aimed for, so we dropped anchor without hesitation and prepared to descend. The water was wonderfully clear, and we could see we had dropped onto one side of a large rock about the size of a small two-story house. Almost immediately we realized we'd arrived on a very, very special day. Circling the rock were dozens of two to three-foot long ocean sunfish, Mola mola. Molas often arrive in the autumn, October and November, spending a few days near the shore. Sea lions prey upon them mercilessly, often biting off their fins and leaving the immobilized mola to die adrift on the bottom. We're not clear whether the fins are an especially valued delicacy by the sea lions, or if this activity is more a kind of sport. We do know that sea lions do sometimes consume the entire mola, because we've photographed the feeding, watching big bull sea lions tear large fish to pieces with their teeth and violent thrashing. But on this day all was peaceful as molas circled us, seemingly without care. Using a bubble-free rebreather, I've gotten spoiled by how unafraid of me many fish are. Without the noise and bright lights of bubbles, I seem much less threatening. Once a few years ago, another buddy and I encountered another group of molas. They'd have nothing to do with us until my buddy and his bubbles were far away. Then the molas swam so close to me I could almost have touched them. But today, even Anneliese's bubbles didn't spook our friends. They made slow lazy circles around us and the rock, allowing me to click off frame after frame, and Anneliese to record them on video with her tiny camera (pictured, above). It was one of the best dives of the last several years for me, and a peak experience to be sure. We'll go back to "Mola Peak" when benign conditions again make it possible to do so safely, but the molas' visit made our first dive there one to remember. 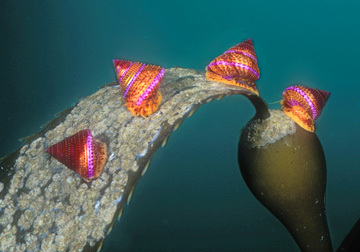 The Monterey Shootout is Central California's premier competition event for underwater photographers. Trhis year I was privileged to be invited as a featured presenter. I had a wonderful time showing some of my recent work alongside three other extremely accomplished colleagues. Since I was not judging the competition, I was elegible to enter. The Shootout is a real test of skill: you arrive at the beginning of the weekend with camera and dive gear, the photographers who do the best work that weekend win the prizes. I was able to squeeze three dives in Carmel Bay in along with my speaking engagement.I was thrilled to find Egg-Yolk Jellies still present in large numbers (they stayed in the area for weeks this year, very unusual). The competition had two categories, one for un-retouched images and another for those produced using some digital trickery. I created the image at right from three separate images: one containing the large jelly at center, then drawing the three in the "background" from two other shots taken the same day. Careful blending allowed me to compose a better composition than nature had offered. To my surprise and thrill, the image won the professional division of the contest. 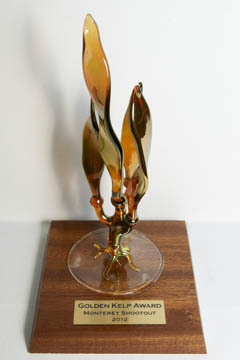 You can see all the winners on the event's website. The 2012 Shootout was a wonderfully well-organized event, offering educational seminars, the image show in which I participated, comeraderie, competition, and some great prizes. As of this writing, information on the 2013 Shootout had not been posted, but I encourage all underwater photographers to bookmark the Monterey Shootout website and plan to participate next year! 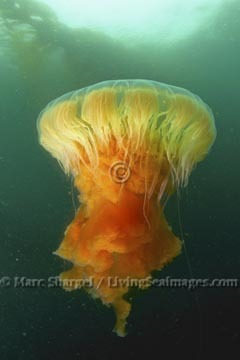 Two dives in Carmel Bay during July revealed the arrival of three kinds of jellies. There were Moon Jellies, and a few stinging brown Sea Nettles, but the most spectacular were the Egg-Yolk Jellies. These jellies have a bluish-white bell with internal organs that typically have a yellowish cast, giving the species its common name. Once before, also in Carmel Bay, I�d seen one with intense yellow coloring inside the bell, and trailing tentacles of a peach-red hue. That sighting yielded one of my most popular images. The jellies I found earlier this month displayed the same rare, exuberant coloring. At the end of one dive, as I ascended along my anchor line to twenty feet for a safety stop, one of these unusual beauties drifted by. Immediately I let go the line, pausing only to make sure my buddy was following the line safely to the surface. I became a pelagic sea creature like the jelly, drifting along side it as it slid between and sometimes around kelp stalks, photographing as we went. After about ten minutes I finally abandoned my gelatinous model, surfaced and headed back to the boat. This greatly relieved my buddy, who thought I�d simply disappeared sea. And I supposed I had, for that kind of ad-lib pursuit of some gorgeous marine animal is my favorite way to spend a dive. Marine scientists and fishermen have both been tracking a very good year for several species in the Monterey Bay region. It all starts with krill, tiny shrimp-like animals that grow in the zillions deep in the Monterey Submarine Canyon. Salmon have been feeding on the krill, creating a good year for those who fish for�and eat�local wild salmon. After the near-total closures of salmon fishing in 2008-09, this abundance is a welcome relief. The krill also attracts baleen whales, which filter them out of enormous mouth-fuls of seawater. On the morning of the 4th of July a friend and I took our little boat out from Santa Cruz harbor in search of the giants of the sea. The Gray Whale migration route to the north toward Natural Bridges yielded no whale sightings, so I played a hunch and turned the boat southward. I pointed us toward the head of the Soquel branch of the Monterey Submarine Canyon, figuring that whales might be where krill grow, and knowing that there is a cluster of historical sightings of blue whales over the edges of the canyon. As we approached the spot where the chart showed the bottom plunging away, I spotted a cluster of fishing boats on the surface, rigged for salmon. As we came even with the salmon boats, the land lubber in our little group spotted the first whale blow. Continuing to a position over the steep edge of the canyon, we found ourselves in the middle of many small groups of whales. When one surfaced near us, we heard the blow, swung our heads to stare as the blowhole submerged and its smooth gray back came into view, punctuated by the little dorsal fin that told us our whale was a Humpback. We saw the bony-looking tail portion of the whale, followed by the fluke itself, with the shape characteristic of Humpback Whales, and encrustations of barnacles at the corners. We spent close to two hours among the whales, rarely moving faster than idle speed, sometimes shutting the motor off altogether. The whales seemed completely unconcerned by our presence, despite the hollow-sounding slap of the waves against our metal hull. A couple times whales blew loudly right next to our boat. The small portion of whale visible at the surface was as big as our boat, and not even a boat length away from us. Like an iceberg, the vast majority of the whale's body was underwater. We moved the boat to get a better view of a whale in the distance. Its blow was followed by the passage of a broad, smooth blue-gray back that just kept going�and going. As the whale fluked, the triangular shape of its tail confirmed what its enormous length had told us: we were looking at a Blue Whale, the largest animal on earth, bigger than the biggest dinosaur that ever walked or swam. 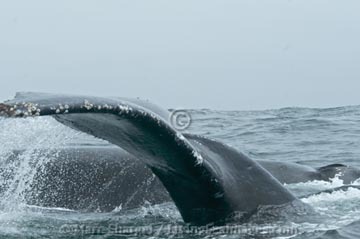 The Blue Whale had a companion, a dolphin whose dorsal fin would appear above the surface for barely a second at a time, usually right behind the whale. The day ended with a thrill I could not have imagined. A trio of Humpbacks surfaced, side by side by side, immediately in front of the boat. They were so close I thought our bow would hit the nearest one. But the three of them all seemed to make the same graceful curve with their tail sections and flukes, maintaining their distance from us.